Plus Size Kitten: Happy Chinese New Year Everyone! HELLO!!! I sudah balik kampung! (back in hometown) in Port Klang! I wanted to post a Chinese New Year Greeting Poster but I don't want curi (steal) images from google so I made my dog model for me! haha although it's Tiger Year & my dog is not tiger/cat, she still look as fierce as tiger!!! Her name is Kopi (Coffee) and she's 14 years old this year! that's really creative! :) I can never get my dog to pose. miu, I like your dog :) hehe... so fierce look! woof! 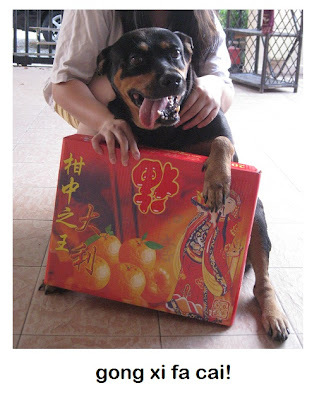 Happy CNY Tammy, hope you're having a good time! your pup so cute.. hehe.. big boy now. my dad's dogs normal breed type.